The Transportation/Automobile Designing course at Strate is not merely a car design course; it is a new way to redesign and reimagine mobility solutions of the future. Strate’s transportation designing course is the ideal platform for budding designers to stoke their passion, hone their creativity, and become world-class transportation designers. What is Transportation / Automobile Design? Automobile design is the conception of newer and improved automobiles. It is often summarised as car design, but the term extends to a multitude of other vehicles. Car design only deals with cars and their ilk. Automobile design, on the other hand, comprises the design of vehicles such as cars, motorbikes, buses, vans, bicycles, trucks, trains, airplanes, etc. Automobile designers team up with development teams to bring their designs to life. Many design teams consist of separate interior and exterior designers whereas some involve designers who can do both. Automobile design brings together both design and engineering techniques and culminates into a practical prototype. While automobile design mostly deals with aesthetics, many designers usually include the vehicle’s functionality in their work. They make designs that are sustainable, safe, and reliable. Doing so also helps in creating a working model of the design rather than a beautiful work of art. The industrial, economic, and societal (r)evolutions, often related to sustainable issues, that lie ahead in this beginning of century encourage us to devise transportation solutions that are both sustainable and responsible. Questioning our experience of contemporary transport is about understanding the evolution of lifestyles in order to devise relevant contexts of future transportation (multimodality, continuity of services, connectivity, etc.) and formalise objects, systems, and services of 21st-century transportation. According to industry body CII, the potential size of the design industry in India is INR 11,681 crore and is expected to reach INR 18,832 crore by 2020. Of this, presently only a market worth of INR 2,100 crore is being realised, meaning more than 80% of the design potential is yet to be realised in India. India has one of the fastest growing automobile design industries in the world. Currently, it ranks 4th and is on its way to becoming a leading manufacturer of cars. Foreign investments and government initiatives in the sector have further fuelled its growth. In view of these developments, the automobile industry is expected to see an 8-12% increase in hiring in 2019. 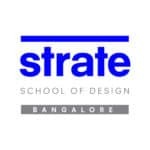 Identifying the need for quality automobile designers in India, Strate has introduced the Integrated Master in Design course with a specialization in transportation design. At the end of the transportation design course, you will receive a BSc/MSc in Design from Jain (Deemed-to-be) University and an equivalent Master’s diploma “Mastere in Design” with RNCP credits from Strate School of Design, Paris. The minimum qualification required to apply for Strate’s Transportation Design course is a pass in Class 12 from any recognized university or board with an aggregate of at least 50%. There is no entrance exam for the transportation design course. However, there will be an interview with the school’s Dean, Thomas Dal, or a member of the faculty to assess your interest in the course. Curriculum for the Transportation Design specialization. The first two years are common for all specializations. It is in the third year that you opt for your preferred course. Click on each year to see what the transportation design course involves. Strate’s Transportation/Automobile Design course trains designers of tomorrow, who will be able to develop a transversal and global vision of these transportation issues (whether they deal with cars, public or individual transport, aeronautics, ships, etc.) with a double exigency in terms of formal and conceptual excellence. Automobile Design, specifically car design, is a field that’s fast-evolving with ground-breaking ideas right now. External factors, such as the economic and energy crisis require the automotive industry to reinvent itself. And at Strate, we are training those who will contribute closely to this industry tomorrow. Strate’s transportation designing course will acclimate students with the fundamentals of design in years 1 and 2. From year 3, the course focuses on and proceeds to skill them in the different areas of transportation design. Students will get first-hand experience in interior design, exterior design, colour and trim, 3D, digital sketching, and much more. At the end of the transportation designing course, students are shaped into professional designers with a flair for innovation and technology.